Since Burma achieved independence from the British in 1948, the country now called Myanmar has been embroiled in civil war, as various ethnic groups have waged bitter battles against the military-led government. After the military junta disbanded in 2011, the country's fragile, emerging democracy has been stung by claims of late that the government is systematically conducting genocide against ethnic minorities in the eastern part of the country near Bangladesh. Yet behind the disturbing headlines, God is on the move, as confirmed by interviews with pastors at a recent conference organized by Global Disciples in Myanmar. 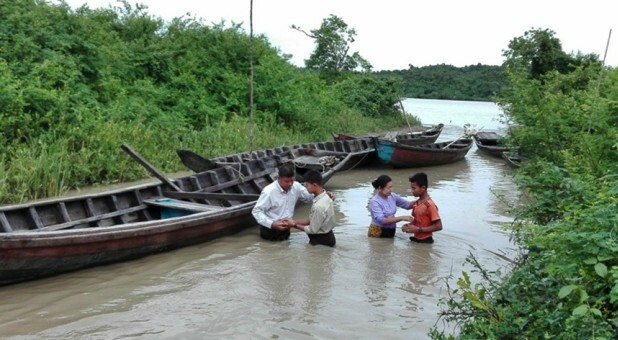 "In the last three years, God has opened the door wide to the gospel in Myanmar. But we don't know how long it will be open," says Brother Matthew*, one of the organizers of the conference. He has been involved in street ministry since he was in his teens and is currently overseeing an effort to plant churches among unreached people groups throughout South Asia. "We want to nurture what is growing and multiplying," he says. "Not just addition, but multiplication." Pastor Imo is one of the pastors multiplying the church by going to tribal groups in southern Myanmar that have never heard the name of Jesus. "By the grace of God, we went from village to village, and many accepted Jesus as their Savior. We went to some places not reachable by boat or motorbike. So we went on foot," he reports. "We baptized 15 into the kingdom and welcomed them into the church. During our outreach, God enabled us to perform a miracle in three places. One brother could not walk due to a knee problem and after we prayed he was able to walk." Another miraculous healing happened with a Hindu woman that had suffered with epilepsy for many years. "When we prayed in the name of Jesus she was healed," he says. They came upon a mother unable to feed her baby because there was no breast milk. "The baby was crying all the time. In their traditional beliefs they thought they could put a root in the baby's mouth, but it was worse than before. When we reached that baby and mom and when we prayed in the name of Jesus, the crying suddenly stopped and to God's glory, after that the family came to church and dedicated their baby to the Lord." "All this happened not because of our might but because of the power of the Holy Spirit," he adds. In northern Myanmar, Pastor Than conducted an outreach in a small town, where he encountered a woman suffering from tuberculosis for many years. "We met her during the outreach. God heard our prayer and she was healed from TB." "Some places are not reachable by motorbike, and we had to walk all day and into the night to reach them. When we did our training and outreach, 10 people were added into the kingdom and baptized. A man named Tan was a leader in witchcraft, but when we reached him with the gospel he left his witchcraft to follow Jesus." Sadly, Myanmar is the second-largest opium growing country in the world, after Afghanistan. "In these areas (of northern Myanmar) the young people are using drugs," says Pastor Nathan. "The drugs include heroin and other ones they smoke." "As church planters we cannot reach them easily, because they do not allow us into their villages. So we have gone there for outreach, and bring some of the drug users back to another town and train them there." Other missionaries have tried and failed to reach some of the villages eyed by Pastor Nathan. "Many church planters have visited this area, but have not been able to stay long. Some people who came here to plant churches became Buddhists, because they were influenced by the spirits," he says. "If by a miracle work of God they become Christians, they are persecuted by the villagers, who cast them out. It is dangerous for those people to become Christians." He showed photos of several emaciated young men who had been using drugs. "This guy is one who is using drugs. They know they will die. By the grace and works of God, after two or three weeks, there are guys who can play soccer now," he reports. "We have some new believers in the surrounding area, but we cannot have fellowship there as a church. If we tried to do a church there the other villagers would not allow us to continue, because the spiritual warfare is very strong, along with their traditional beliefs. We also face problems with Buddhist monks in that area." But by helping young people addicted to drugs, he finds favor with their parents, who will invite him in and listen to the gospel. "This is our strategy for evangelism in that area. I believe that within four of five years, many churches can be planted in this area." Recently, he trained 15 disciples who will go out and preach the gospel to unreached villages. After his last outreach and training programs, 74 people were baptized. "We can see God has done a great miracle. The gospel is changing things in that area."